We’re passionate about seeing people find their satisfaction in God alone. We believe this happens only when people become disciples of Jesus – when people increasingly know, love & form their lives around God’s son, Jesus Christ. One of the ways we encourage this discipleship is through targeted training called Discipleship Training. Discipleship Training is designed to equip people from all walks of life to follow Jesus in all of life, whether that’s at home, at school, in the church or in the workplace. If you’re just exploring who Jesus is or you’ve followed him for decades, we’d invite you to make Discipleship Training a regular part of your life. To make it easier for you to attend classes we are striving to provide childcare for each class. Please read about our policies here. When will courses be offered? 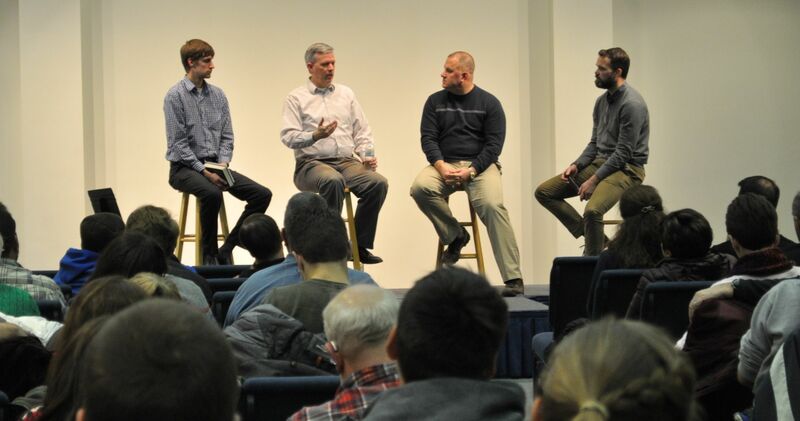 Discipleship Training courses will be offered three times a year: spring, summer and fall. Most of the courses will be offered on Wednesday evenings from 6:30-8:00 PM. Some may also be offered during the daytime, whether on a weekday or a weekend. What is the expectation when registering for a course? Please register for classes if you know you can commit to attending the first session and at least 80% of the course. Most courses last either 3 or 6 weeks. Individual sessions (talk, discussion, Q&A) will last between 1:15 to 1:30 hrs. What is a Friday Forum? A Friday Forum is a one-off, normally 1-hour-long talk, given on a Friday evening, sometimes by an outside guest, on an important topic, followed by (and sometimes interspersed with) Q&A. Everyone is invited to attend. Childcare will not be provided for Friday Forums but assistance is available. For information, please contact jared.compton@cwc.church. Discipleship Training is open to everyone. Discipleship Training courses will be offered at the building in either one of the classrooms or the lobby. In the future, we’d love to offer courses offsite, whether in your home or at a ‘third place’ (community center; library, etc.). Yes. Contact jared.compton@cwc.church for more information. Do I have to register to take a course? Yes, registration for each course will be encouraged to help manage class size, hospitality (coffee, etc.) and childcare. Who will teach each course? Courses will be taught by all sorts of qualified teachers, from elders, to gifted lay-persons, to outside guests. How many courses should I take per year? The Discipleship Training curriculum can be completed in six years at a pace of 2 to 3 courses per year (approx. 12 individual class sessions). The Discipleship Training curriculum can also be completed in ten years at a pace of 1 to 2 courses per year (approx. 6 individual class sessions). What if I want to learn more about certain topics covered? Each Discipleship Training course will recommend a graduated reading list for interested participants, drawing their attention to good resources at various levels that they might pursue next. We’ll also regularly offer two elective courses each summer. Some of these will explore certain Discipleship Training course topics more deeply. What if I want to learn about topics not covered? Additional courses will be offered as electives each summer. These courses will cover certain topics not covered in the Discipleship Training curriculum and will cover certain topics in the Discipleship Training curriculum more deeply. Start is designed for people just beginning to follow Jesus and for those not yet following Jesus. It's a great place to take a first step towards knowing Jesus and exploring what he is all about. Connect is designed for anyone ready to join in to the life of our church through membership and community. Grow is the bread-and-butter of the training, designed to equip disciples to follow Jesus in all of life.